A friend of mine has started writing a little food column, where she takes a recipe and gives it a try, as a novice cook. She asked me for ideas of what to make—my list included two things that I had actually never made from scratch before: angel food cake and mayonnaise. Today I crossed one of those off my own personal list. 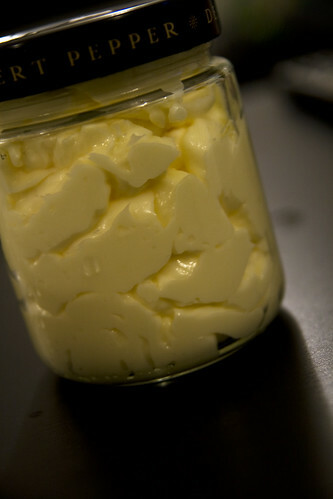 No, it’s not a specimen in a jar, that is homemade mayonnaise! it’s in one of the Desert Pepper salsa jars that I use as drinking glasses—I keep a handful of the lids around, which makes my glasses available for mixing up salad dressings or storing things that need storing. Conversation with other food-minded friends today sparked a craving for mayonnaise like I have never had before in my life. I know the mayonnaise debate can get quite heated—just ask my Aunt Kathy and her daughter Meaghan, who stand staunchly on opposite sides of that egg-oil line. Meaghan thinks the stuff is vile; Kathy feels it is “UNAMERICAN” to dislike mayo (nevermind that the foodstuff is French, named for the duke of Mahon). I swear, every single lunchtime conversation at beach week veers into the Great Mayo Debate. But I’ve never been able to get my hackles up on the subject. I like mayo, sure, but I don’t love it. I like a little moisture on my sandwiches, and I’ve recently decided that a burger with mayo is better than a burger with ketchup (though give a hearty stir and I’m pretty happy, too). When I worked in a restaurant, I loathed the people who requested sides of mayo, because it meant sticking my whole arm up to my elbow into the almost-empty-but-not-quite economy size jar of the gloppy white stuff. But now I’m that person—okay, I guess I’m a mayo fan. But I was never a fan like I am now. I used Berlin’s Whimsy‘s recipe for garlic mayo, because I figured why just do something basic when you can do something sublime? I had all the ingredients on hand and my food processor was out and ready to go anyway. And the results—after all of 3 minutes’ effort!—were well worth it. I even stopped off at Five Guys to buy fries just for the occasion. Of course, 2 cups’ worth of oil means I now have a LOT of mayonnaise. Looks like I’ll be eating a lot of BLTs! I’ve never really been much of a mayo person since my condiment love is all wrapped up in mustard. Might have to try that recipe though and try it in a chicken salad. nom nom nom….I’m on my way over now! I heart mayo. Nice work! Homemade mayo is really an entirely different condiment from store-bought mayo. My life wouldn’t be complete without mayonnaise. Homemade or not, it doesn’t matter. That is all. Looks lovely to me! I try to moderate my mayo consumption but if it wasn’t so unhealthy I’d eat it all the time. Oh it looks heavenly, heavenly. I love mayonaise too, I shall have to give your version a try. I will definitely give this a try. Tell me about Five Guys. We just got a few locations here in Houston, and I’m not familiar with them. Are they a favorite of yours? This whole mayo discussion has just furthered my need for a food processor. I’ve never felt very strongly about mayo either way, but maybe that’s just because I’ve never had really good mayo? Put me firmly in the Pro-Mayo camp! That looks delicious … I might have to try it this weekend. that’s awesome that you made mayo from scratch!! And garlic mayo, at that- Mmmm. There was a time that I didn’t care for mayo…but then when I learned (from many lunch eating experiences) that you could make the mayo happier with additions (like garlic and chipotle or what have you) it totally reformed my thinking…and homade mayo, I think, just tastes better. One of the first things my brother in law first taught me to make (he’s french) was mayonnaise. You may want to attempt making it by hand one day (without the food processor) as it can really build up your culinary repertoire very quickly if you can do that. Plus the taste of homemade mayonnaise is truly outstanding! Homemade mayo! YUM. I love me some mayo (though I can’t compete with my mom, who ate mayo sandwiches – i.e., Hellman’s slathered on white bread, that’s all). This sounds so good. In Lebanon they always give you a side of this garlic sauce when you order chicken. I was told it’s just garlic blended in a food processor with oil slowly added. 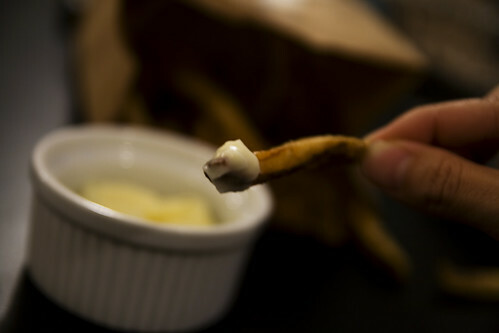 It comes out to the consistency (almost) of mayonnaise but with more texture and more garlicy. It’s divine. I love mayo on fries too, btw. Learned it in Europe and I can’t help but do it even though it is so bad for you! Feeling like I need to go make mayo for the first time too…. My boyfriend makes the best homemade garlic mayo ( here in Spain is called alioli). I love it with fries, tortilla, sandwiches, meat etc. It has an special taste if you make it with olive oil ( a bit strong maybe, some people don’t like but i do). You inspired me to try making mayonaise myself, but alas with lackluster results to say the least. http://www.goodcrafternoon.com.